Mmm ... cozy! An elegantly carpeted living room provides a warm atmosphere for entertaining your friends and family. Unfortunately, it also seems to provide the perfect target for spills and stains caused by holiday goodies. Here are our emergency carpet cleaning hacks to the rescue, using materials you're likely to have right in your kitchen cupboard. Treat any spillage as soon as possible before stains can set -- and before the mess can get tracked all over your house. Use a blotting motion; never rub hard or you might damage the pile. Work from the edges of the stain toward its center to minimize spreading. Test your carpet in an inconspicuous place before applying water or other liquids. No need to saturate the carpeting; that will make it difficult to dry completely. Your readily-available tools: a clean white cloth or a sponge, together with a moderate amount of lukewarm water. Very hot water is your enemy for this type of cleaning. Not only can it shrink wool carpeting, it is capable of "cooking" protein-based stains (containing milk, egg, blood, or meat) till they are nearly impossible ever to remove. Though eggnog tastes sweet and innocent, it packs quite a punch when you enjoy a mug or two. Same thing when it lands on your carpet. Clean eggnog up fast before it produces an aroma that'll put you off dairy products for life. Start by working in a bit of mild dish soap solution (1 teaspoon to 2 cups warm -- not hot -- water). Should follow-up be necessary, use white vinegar mixed 1:2 with water. If you still detect an unpleasant scent heading toward Valentine's Day, try a pet-odor remover. Some folks swear by club soda as the antidote to red wine spills, while others claim that plain water is just as effective. Whichever camp you belong to, you are doing your carpet a favor by rinsing it off as quickly as possible. Being as it's almost colorless, white wine won't harm your beautiful carpeting, right? Wrong. Its relatively high acid content can cause off-coloring of the carpet. Sprinkle lightly with alkaline baking soda to neutralize the acid. Let dry, then brush off or vacuum up the powder. Coffee may be considered the perfect solution for how you feel the morning after the night before. And the perfect solution for coffee spills on the broadloom is application of 1 teaspoon of dish detergent mixed with 2 cups of lukewarm water. The deep red of cranberry sauce goes so nicely with your new carpeting -- not. Take care of the glop by sponging with 1 teaspoon white vinegar combined with 1/4 cup rubbing alcohol. Repeat if needed. Yum yum! Whoops! Chocolate seems to make a mess in direct proportion to its deliciousness. By contrast to the advice for cleaning other stains, leave a chocolate-y carpet alone until the confection dries. Gently scrape off as much of the goo as you can, using the edge of a spoon or blunt knife. Apply a mild soap solution, rinse sparingly, and repeat as required. Once again, scrape up the sticky candy solids. Then dab on dish detergent solution. Follow up by blotting the soiled area of carpeting with clear water to remove the sugar residue (which may otherwise caramelize, resulting in just what you don't want -- an ugly brown spot). To the canine member of my household, spilled gravy is not a problem but an opportunity. Disclaimer: our flooring is laminate, not carpet. For carpeted floors, it's urgent to scrape up as much gravy as you can, blotting the rest with baking soda or cornstarch. After 15 minutes, vacuum up the absorbent powder. Treat the greasy spot that remains with dish detergent or dry cleaning solvent. 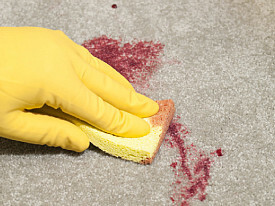 Still stumped by holiday food stains on the carpet? Call a professional cleaning service -- or treat yourself to brand new carpeting.